Available in two capacities, the Digiweigh DW-PP portable scales provide milligram readability at an affordable price. Whether you are weighing precious gems, gold or reloading ammunition, these scales provide consistent weighing performance. A flip down cover protects the scale while in transport and acts as a wind break for highly accurate weighing. The high density ABS case is sturdy and tough. Powered by 2 AAA batteries, the DW-PP series can be taken anywhere and weigh without access to mains power. 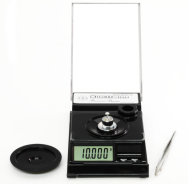 Each scale is provided with tweezers, a calibration weight and pan extension for weighing larger items.